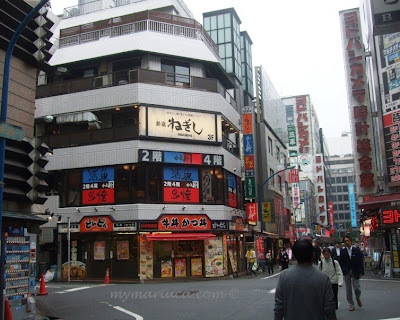 We arrived at Washington Hotel in Shinjuku, Japan early in the morning. There was no such thing as "early" check-in for the hotel so we had no choice but to leave our luggage at the hotel with three long hours to kill. Usually this would not be a problem for me but having just spent more than 12 hours travelling, all I wanted to do was check into my room, get a hot shower and a little relaxi-taxi before exploring the city! Unfortunately, thanks to the no early check-in policy, B and I together with the three friends travelling with us had to reluctantly start exploring the city at the ungodly morning hour of 10am! Back home, I wouldn't be up at this hour but hey, I was on vacation so I guess a change was necessary. After walking around aimlessly for twenty minutes, we were relieved to discover a nearby Starbucks; practically the only familiar sight so far! I so needed my coffee especially since I did not sleep the whole night and day prior to our flight from Malaysia. I did not sleep on the plane either. So our very first stop upon arriving in Japan was none other than everybody's beloved coffee place, Starbucks! Coffee time at good old Starbucks! I love coffee, don't you? In fact I just started my day and am having my first cup for the day. Coffee keeps me sane and I seriously can't and refuse to function normally unless I get my cuppa of love first. Addicted you say? Definitely! 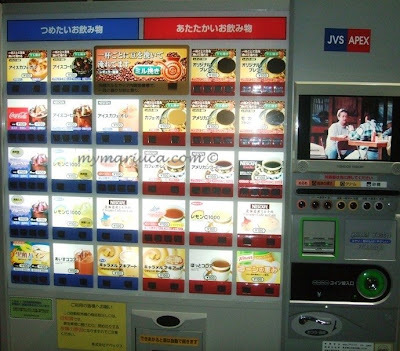 One of the things I loved about Japan was the abundance of drink vending machines, scattered everywhere throughout the cities. There were all sorts of cool vending machines at every corner, which was so interesting to see. 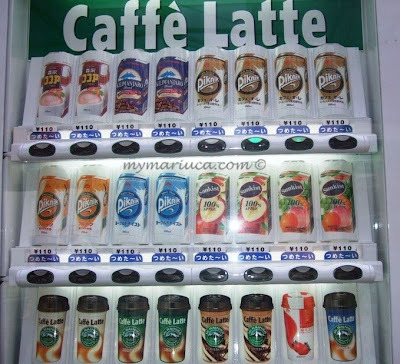 My favourite vending machines are the coffee machines of course. If you're a huge coffee lover like me, you'll definitely be spoiled for choice with the many different types of coffee available in a single machine. I'd spend at least two minutes deciding what to have and B will always have to remind me to make up my fickle mind already! I think I had coffee every day while I was in Japan. That's nothing new you might say, but it was simply because I had the luxury of choosing a different type of coffee at each vending machine that caught my eye! And trust me, there were plenty to choose from. Mariuca was in coffee haven for a week! And speaking of coffee, have you seen the new Keurig Single Cup Coffee Maker yet? Available in black and white, you will enjoy FREE delivery, FREE shipping and FREE K-Cups when you make your purchase. Flavoured coffees are also available like my favourite New Orleans Style French Vanilla and Double Chocolate! Apparently suitable for home-offices especially, I am totally enticed by this new cool coffee maker. I'm going to check it out now; feel free to do the same, if you're a coffee lover like me that is! cish. i missed it!! lol! am still online though really busy.. the final few days.. hahaha.. so keeping low profile.. see you later dearie! haha...it's ok Mariuca....must add smileys mah LOL!! 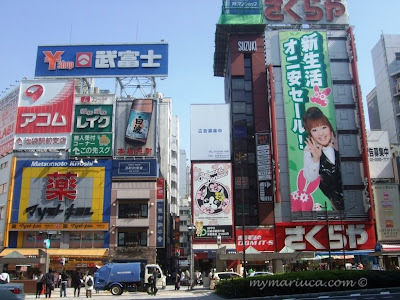 Yeah, I loooooove Japan for their technology, everything ada and they make it so convenient for u. Japan was efficient in every way, my type of place, tak yah throw tantrum! I just reset my FCSB Mon! U my TFC here last month yay! Addicted to coffee, sure cannot stop so soon… remember u “tricked” me in ur post saying u want to quit drinking coffee, made me panic there for a while LOL! stop! so don panic! LOL!! Hahahahah of coz la remember cause while reading it, I felt bad cause got no coffee fren if u quit coffee LOL!! u are oso my TCO...LOL!!!! Yay for pinky buddies too! I haven changed my badges at MD or at MPG yet! mine no need to change! just ve to change TD oni hahhahaha! I haven changed my TD oso oh no so many changes LOL! R and me good taste in food la, grilled fish, spicy stuff…only he doesn drink coffee like me lol! LOL! Now only have to change badges for MPG! Poor R kena force to cook now hahahah! Some more mug cake oso u haven made for him Mon! Darn, missed by a mile! LOL! me too looking forward to my mug cake......hahahahahahha! Hahah.. I'm thankful at least still got streamyx.. lol! Sleeping soon ni.. just clearing some stuff.. Likewise, posting one more and then zzzzz! Ha ha, good la to not be as addicted to coffee as me, Foong. You drink tea then? Yes to both your questions Foong LOL! I love coffee too Ayie, I try to cut down but it’s hard! My fave is caramel frappe! Tell me abt it Jean, so many to choose from!